One of the most significant contributions by an African American slave in the construction of the Capitol was made by Philip Reid. When construction of the Capitol began in 1793, Washington, D.C., was little more than a rural landscape with dirt roads and few accommodations beyond a small number of boarding houses. Skilled labor was hard to find or attract to the fledgling city. Enslaved laborers, who were rented from their owners, were involved in almost every stage of construction. Philip Reid may be the single best known enslaved person associated with the Capitol’s construction history. Mills brought Reid with him when he moved to Washington in the late 1840s when Mills won the competition for an equestrian statue of Andrew Jackson commissioned for Lafayette Park. In order to construct the Jackson statue, a temporary foundry was erected south of the White House and, through trial and error, Mills, Reid and other workmen produced the first bronze statue ever cast in America. The accomplishment was extraordinary due to the absence of any formal training of any of the participants. 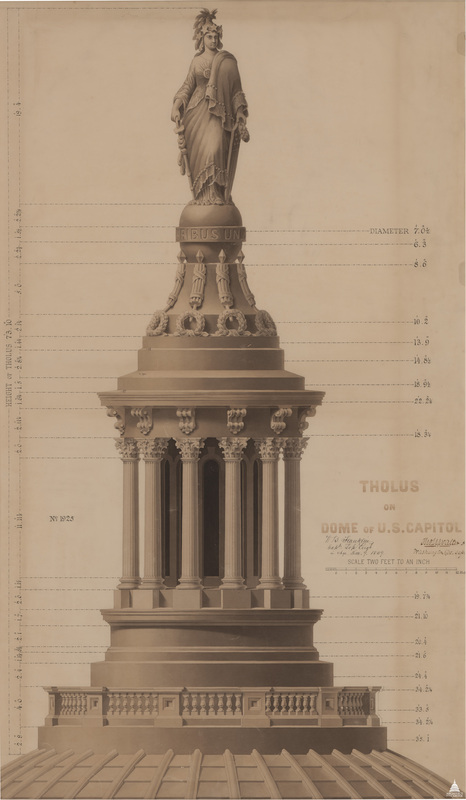 In 1860, the success of the Jackson statue prompted the secretary of war to give Mills the commission for casting Thomas Crawford’s Statue of Freedom for the top of the Capitol’s new dome. A financial agreement was reached whereby the government would rent Mills’ foundry, pay him $400 a month for his services and pay for necessary materials and labor. Reid was the only known slave working on Freedom. He worked as a laborer along side James A. Riddle, Peter Coyl, Resin (Rezin) Offutt, and Mikel Shedy (Michael Sheedy). As an enslaved worker Reid was paid directly for his work on Sundays; his owner received the payment for his work the other six days. He was paid at $1.25 per day, higher than the other laborers who received $1 a day. 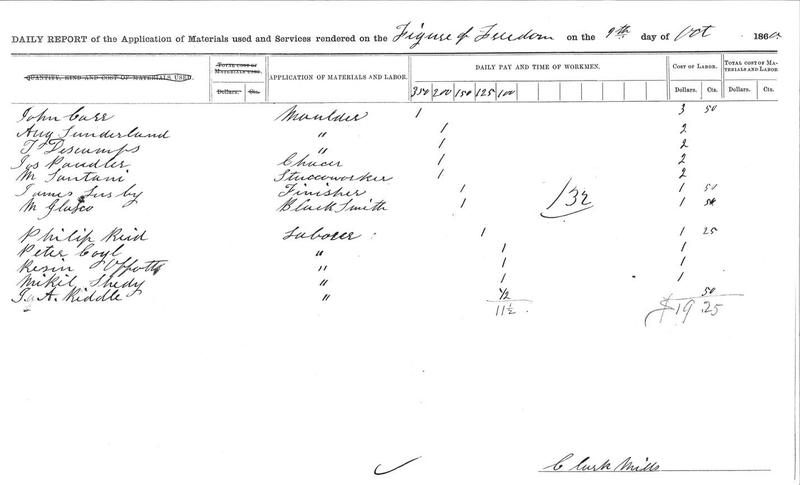 View a daily payroll report documenting Philip Reid and other workers at Mills’s foundry. Reid worked most weeks without a break between July 1, 1860, and May 16, 1861: over that period he was paid $41.25 for 33 Sundays at $1.25 per day, for “Keeping up fires under the moulds.” He signed with an X by his name. View his original pay voucher signed by the Architect of the Capitol in 1862. There are no known images of Reid. In June 1860, casting of the Statue of Freedom began. The first step was to disassemble the plaster model of the statue into its five main sections in order to move it from the Capitol to the foundry. The model was shipped from Rome to the United States in five main sections, and upon its arrival, an Italian sculptor was hired to assemble the model. However, when the time came to move the plaster model from the Capitol to the foundry for casting, no one knew how to separate it and the Italian sculptor refused to help unless given a pay raise. Fortunately, Philip Reid was there. He figured out that by using a pulley and tackle to pull up on the lifting ring at the top of the model the seams between the sections would be revealed. The statue was successfully separated into its five sections and transported to the foundry. Philip Reid received his freedom on April 16, 1862 when President Abraham Lincoln signed the Compensated Emancipation Act that released certain persons held to service or labor in the District of Columbia. It is not known if he witnessed the event, but Reid was a free man when the last piece of the Statue of Freedom was put into place atop the Capitol Dome on December 2, 1863. Author S.D. Wyeth wrote in The Federal City in 1865, “Mr. Reed, the former slave, is now in business for himself, and highly esteemed by all who know him."